1 Comment on Kitchen Cabinet Accessories – What Will Work For You? Is your kitchen a pleasant place to work in? Or are you hassled by the unorganized clutter all around? If you still don’t have your peace of mind while working in such a kitchen, it’s time you thought about some kitchen cabinet accessories. Having a set of kitchen cabinets alone is not enough to make your work easy. They need to provide easy and functional storage. Kitchen cabinet accessories nowadays can greatly reduce the workload associated with arranging and stacking kitchenware and other handy tools. While you may already have functional cabinets, some accessories are always handy with small items like spatulas, bottle opener, strainers etc., which otherwise are frantically searched for in one of the baskets or drawers. 1. 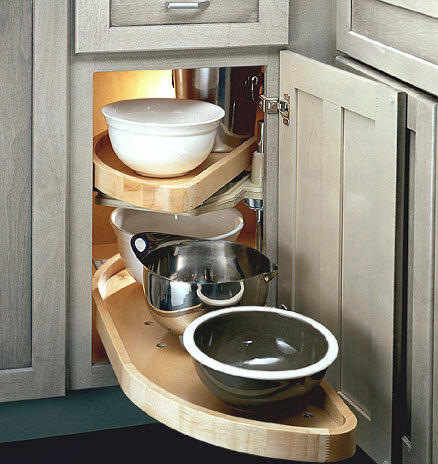 Functionality: They should not only fit well in your existing cabinets but also create that extra storage inside it. For example, using a drawer divider could help you organize cutlery inside it. Or a hanger inside cabinet door could be used to hang your most frequently used cups while not disturbing the arrangement of other exotic cups and saucers in that cabinet. Or even a dish stacker inside the cabinet drawer could make your life simpler by just having to insert dishes vertically. 2. Pattern of use: If your style of cooking is to first get all the ingredients and kitchen tools out before you cook, then kitchen cabinet accessories like a spice basket can be helpful so that your daily use ingredients can be safely stacked there while you use them. And if your style is to pick, use and put back kind, then a spice drawer is a good choice so you don’t have to open numerous drawers time and again. 3. Style: Backsplash area can be given a stylish look with some chrome finish kitchen railings, racks or just some tile finish wall stick on. Or you could stick your knives on a magnet bar that gives an arranged look and reduces hassle of searching the suitable knife. Based on the above, you can choose numerous kitchen cabinet accessories for all your cabinets and drawers that stack everyday cutlery, kitchen equipments like spatulas, napkins, tea cups or even your regularly used grocery packets. For those who like to stack their wines and wine glasses stylishly, stemware racks or wine racks can add that elegant touch. You could use it inside the cupboard or put it near the dining table, to create a mini bar look. For your dining table, you can use a Lazy Susan table top to get food rotating without your much moving around. A very interesting accessory for your pantry stocking would be a pole rack system. Without occupying much space and being easy to assemble, pole rack can increase storage manifold and also give a good look to your kitchen corner. For those who do a lot of baking, baking racks of wrought iron or wood come in stylish designs and are convenient for keeping pastry serving dishes, tea pots and other related equipments. A very convenient and much needed accessory is a wall mount trash bin that can be placed at the side of your worktop area (as this is where most of wet waste would be generated). Or you could just hang it on inside of your sink cabinet doors. This would keep it hidden behind and at the same time keep your kitchen environs clean. The best thing about using accessories is that you don’t need to plan them in advance while your kitchen is being designed. Cabinet add-ons are the most useful way of utilizing space. There is no section of your kitchen that cannot be accessorized. Even the stylish knobs and handles can be selected as part of accessories. Ultimately it all depends on what and how many times you need a particular kitchen tool or item. And some kitchen cabinet accessories like railings, stick on hangers etc. are anytime handy to use. Cost of kitchen cabinet accessories can vary based on materials like chrome finish steel, plastic, wrought iron etc. They can also be priced based on their functionality and brand. For example a good brand of kitchen base cabinet organizer can probably be expensive than an unbranded one. Yet it is the quality versus price trade off that should be criteria for purchase. Click here for the best deals on kitchen cabinet accessories. You have a wonderful site with lots of useful information in it, Ganka. I will indeed recommend your kitchen blog to my friends.